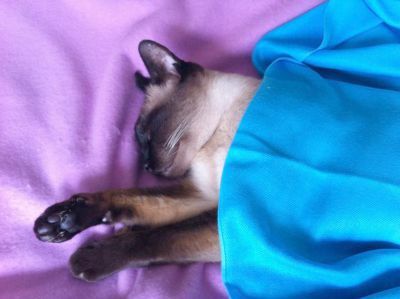 Welcome to July's Meezer Musings! This month we're looking at the sticky (literally) issue of cat pee and in particular, cats who pee in places they shouldn't. Before I got Bandit and was thinking about adopting a cat I was chatting to a visiting cat-loving friend about the pros and cons, dos and don'ts, expenses and so on that go with being a cat owner. My friend was enthusiastic and supportive and gave me all sorts of reasons why I'd never regret homing a rescue. As she left, she threw the words "... and cats are such clean animals" over her shoulder. It's been cold, but otherwise he hasn't a care in the world! Cats have a reputation for being clean animals and certainly they're good at looking after their coats and keeping their ears and paws and claws (and other less savoury parts!) well-groomed. But if the number of emails I get about this topic is anything to go by, what they're often not so good at is keeping the environment around them clean by always peeing - and pooping, but we're only talking about peeing this month - in their litter boxes. It's one of the main reasons why cats end up in shelters and rescues. Bandit has not always been the cleanest of cats. If you remember, Bandit is a rescued stray. We know next-to-nothing about his background and I've always rather fancifully imagined that he might be an ex-stud boy who was neutered late. He's very territorial and it became clear not long after he arrived that he had a tendency to both pee and spray in odd corners of the house, which made me wonder if this was why he was abandoned in the first place. He'd use his litter trays (he has three all to himself!) but would occasionally decide that he'd rather pee in a quiet corner somewhere else. As he settled in with us, this tendency died down and because he has outdoor access during the daytime, it became much less of a problem. Just recently, however, it's all started up again. In case you don't know the difference, peeing is simply urinating, generally in a squatting position. Spraying is a territory-marking behavior, usually carried out standing up, backed up against a vertical surface with a distinctive trampling motion of the paws and quivering tail. It mixes urine with pheromones for a stronger-than-urine smell as a warning and signal to other cats. While spraying is most common in entire males, both neutered males and females may continue to spray after neutering or spaying. What causes a cat to pee outside the box? It's difficult to get inside the mind of a cat but there are three main reasons why cats avoid their litter boxes. Territory. Cats may spray or urinate anywhere they believe will mark an area to tell other cats to 'keep out'. So you have to become something of a detective to try and work out what's causing the problem. The most important step is to rule out any medical issues, so a trip to the vet for a check-up should be your first priority. Urinary tract infections or blockages - known in cats as FLUTD or feline lower urinary tract disease - are extremely painful, and can even be fatal if not attended to. Next you need to consider any changes that might have affected the cat's routine. Are the litter trays scrupulously clean? Have you changed the type of litter? Moved the position of the boxes? Changed your flooring or carpets? Moved or changed any of your furniture? Moved or changed anything? Are you yourself going through stressful times? Job loss? Divorce? Arguments? Illness? Expecting a baby? New boyfriend or girlfriend? Once you've considered anything above that you may have done that's affected your cat's well-ordered world, you need to think about other cats. Have you brought a new cat into the house? Seen any new cats (or dogs) in the area? Even indoor cats with no access to the outside may get stressed if they see other cats through the window. Perhaps another of your cats has died? All cats may grieve, and Siamese cats who form strong bonds with others seem to grieve very deeply when a companion dies. In addition to the medical and emotional factors, you also need to work out where your cat is peeing. This may of course be quite clear; if your cat's urinated in the middle of your bed (a favorite with many cats, although thankfully, not with Bandit) or left an obvious puddle you're going to notice it. But if you live somewhere with nooks and crannies where the urine has time to dry, you may not immediately be able to trace the source of the smell and you'll need something to help you find it if you don't want to spend your time crawling round on your hands and knees sniffing the flooring. After years of wanting one, I recently invested in a urine-detecting ultraviolet blacklight like the one in the picture. The one I bought was actually called the Super Urinator (! ), available in the UK, but not the USA. The one I've linked to is very similar but less expensive than mine. They make you feel just like a CSI! You switch off all the lights, switch on your flashlight, and examine your house for urine traces, which show up as yellowish/white areas under the blacklight's beam. It's particularly effective at picking up old, dried urine stains. Spray shows up on the walls to a height of about the cat's eye level, whereas urination can be traced from puddle-shaped stains on the flooring or carpets. It was something of an eye-opener to discover just how many places Bandit had sprayed. Once you've carried out all your detective work, you'll need to clean up. There are a number of home remedies for cleaning up urine stains and smells, including solutions of spirit vinegar and water, or baking soda sprinkled directly onto the carpet. I've tried these but didn't feel that they worked particularly well for me. To my mind the best way of cleaning up, if you want to use products you might have around the house, is a warm, fairly strong solution of biological washing powder which you apply, leave to do its work for around 30 minutes, and then clean up by rinsing well. You can follow this up by dabbing with rubbing alcohol (surgical spirit), which helps to remove any lingering fatty traces. There are of course any number of commercial solutions too. If you go down this route you need one with pro-bacteria and enzymes, which help to break down the urine's chemical structure. I'm trying out one of these right now and so far it's working well. Called Simple Solution Cat Stain & Odor Remover , it comes in a 32-ounce spray bottle. I found that, particularly on carpet, you need to use a lot of this for it to be effective so I also bought a one gallon refill bottle because it's useful to have both the spray bottle and the larger quantity of cleaner. On tiles and wooden floors this works very well though, and once dry, has a mild, pleasant perfume that reminds me of furniture polish or spices - cinnamon, perhaps? - and eventually, any smell disappears completely. Everything above is just an overview of a very complex subject. There's much more I could say on this, but it would need a whole book (perhaps I'll write one, one day!) but I hope it's useful. The problem does seem to be very common and if you're affected by it, I really feel for you as there have been days when I've felt totally discouraged by having to clean up yet more cat pee. But the good news is that it can be managed if you keep on top of it, and certainly, in Bandit's case, the love that he gives us more than makes up for the downside. Bandit, incidentally, is fine - as far as we can tell this is not a medical problem in his case, it's much more likely to be a psychological one. I've added a new story this month from Javier in California. You can read all about his kitten, Sir Boo!!! (those exclamation points are important), in My Handsome, Lovable Little Terror. 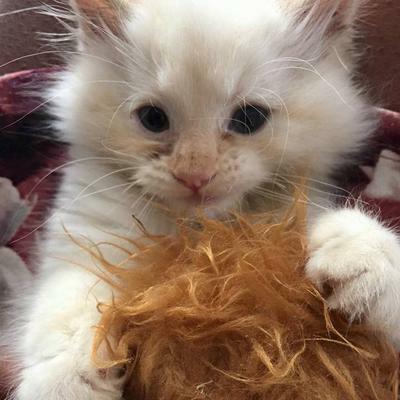 Our Meezer of the Month for July is Andrea Higbie's kitten Pye, who'll be one year old in September. What beautiful dark blue eyes! 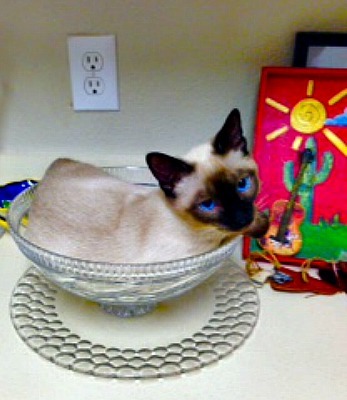 Pye's found the perfect place to pose, in the candy dish. Happy birthday Pye, and thanks so much for sharing your photo, Andrea! This month's fun Facebook photo was posted by Myriam Crijns. It was extremely popular - unsurprisingly, as it's such a wonderful photo in so many ways. Myriam says "this is my boy Suri. 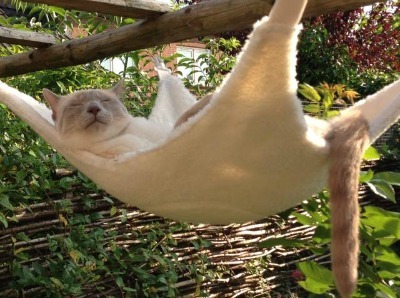 He loves dreaming in his hammock". And what a wonderful hammock it is and I love Suri's tail hanging over the edge! Sadly, that weather didn't last long and the latter part of July has been wet, cold and windy - the photo of Bandit at the top of the page was taken on one of those days. We hope however, that it's sunny wherever you are, and of course, whatever the weather, it's always sunny when there's a Siamese cat around!